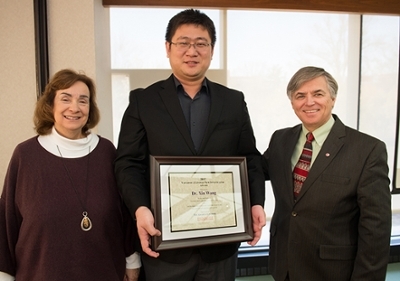 Xin Wang, PhD, assistant professor in the Southern Illinois University Edwardsville School of Engineering’s Department of Electrical and Computer Engineering, has been recognized with the 2017-18 Vaughnie Lindsay New Investigator Award. Chancellor Randy Pembrook presented the award during a special reception held Tuesday, March 21 in the Morris University Center. The award honors tenure-track faculty members whose research and creative activities have the promise of making significant contributions to their fields of study, their respective schools and departments, and SIUE as a whole. Wang will receive a combined $12,500 from the SIUE Graduate School and the School of Engineering to be used in a one-year period. “Dr. Wang’s research has the capacity to impact his field of study and clearly exemplifies the spirit of the Vaughnie Lindsay Award,” added Jerry Weinberg, PhD, associate provost for research and dean of the SIUE Graduate School. Wang’s project, “Ushering in the Smart and Autonomous Power Converters for Utility Power Grid,” proposes an innovative method of designing power converters, which will keep the power grid stable even when power is coming from solar, wind and other forms of distributed power generation resources, which directly connect to the grid through a converter. Photo: (L-R) Sandy Doreson, daughter of the late Dr. Vaughnie Lindsay, Dr. Xin Wang, and SIUE Chancellor Randy Pembrook.